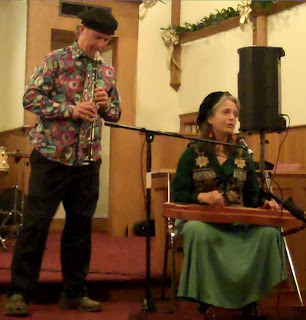 Steve Davidowski's Christmas benefit concert returned Monday, December 19, at the Marshall Presbyterian Church. This mix of jazz, traditional mountain and celtic Christmas music has delighted audiences for the past three years. The concert benefits Neighbors in Need, a crisis food pantry in Madison County which gives food and financial assistance in crisis situations for Madison County residents. Neighbors in Need is a 501(c)(3) charity supported by local churches and volunteer workers. All concert monetary and food donations will go directly to Neighbors in Need. Marshall's favorite Steve Davidowski is a pianist/saxophonist/flautist/clarinetist. While living in Georgia in the 1970s, Davidowski was the original keyboard player in the southern fusion band The Dixie Dregs, and also performed and recorded with Vassar Clements and many others in Nashville. He is a master of jazz and is also developing a mountain music hybrid he calls Xenobilly. Thank you to the musicians who donated their talents and time! Join the Christmas spirit for an evening of great jazz and the opportunity to help your Madison County neighbors.